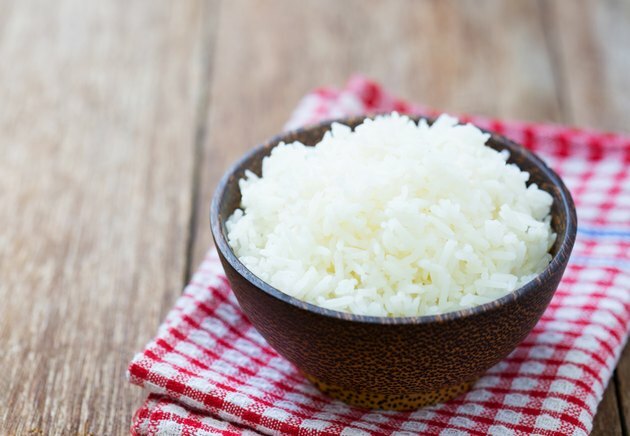 Steamed rice adds toothsome, nutty -- and, importantly, gluten-free -- substance to health-minded meals. A rice cooker is the ideal tool to cook rice to fluffy perfection, but a resourceful cook has other options: both new-school electronic steamers and decidedly old-school bamboo steamers do the trick brilliantly. In each of these devices, hot, moist steam completely surrounds the grains of rice inside, cooking them to perfection. Busy cooks, take note: both types of steamer also stack, allowing cooks to steam three or four different foods over the same simmering water. Check your user manual. These instructions are applicable to most electronic steamers, but some vary -- sometimes, widely -- from this process. If you've lost your user manual, run an Internet search for your device's name and model number. Measure the amount of rice you plan to cook into the large bowl. Pour enough cool water into the bowl to cover the rice by a couple of inches. Reach in and massage the dust, dirt and excess starch from the rice. The water will quickly become thick and milky. Carefully pour off the starchy water. Repeat this process until the water runs almost clear. Rinse and dry the rice bowl accessory that came with your steamer. Measure two parts water to one part rice and pour each into the rice bowl. Fill the steamer's water reservoir to the "max" line. Place the drip tray under the base. Place the rice bowl inside the lowest steaming bowl if your steamer is multi-level. Firmly fix the lid on the rice bowl. Steamed white rice will be ready to serve in 20 to 25 minutes. Brown or wild rice should steam for about 45 minutes. Rinse and dry your bamboo steamer. Cut and fold your parchment paper to create a liner for the bottom and sides of the bamboo basket. The liner will prevent the rice from falling through the seams in the woven bamboo. Pour your well-rinsed rice into the lined steamer basket. Cover the steamer basket snugly with its lid. Make sure your steamer basket sits securely in the wok. Take note of where in the wok the bottom of the basket sits. Move the basket out of the way. Add filtered water to the wok until the water level is about halfway to the line where the steamer basket bottom will sit. Dial the stovetop to high heat, bringing the water to a boil. Reduce the heat to a gentle simmer. Seat the steamer basket into the wok. Ensure that the bottom of the basket is not submerged in water. Check the water level every few minutes, adding more every time the level drops by half. Test the rice after 20 minutes, continuing to do so every five minutes until the rice is cooked to your liking. To add subtle flavor to rice cooked in a bamboo steamer, use alternative materials to parchment paper to line the bottom and sides. Experiment with banana, pandan, grape, cabbage and shiso leaves. Corn husks can also be used. Use broth or another liquid to infuse even more flavor into your rice.